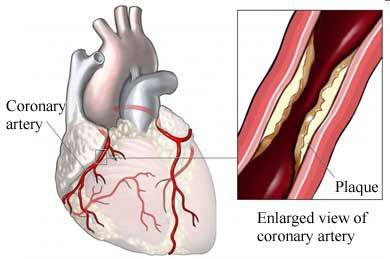 Coronary artery disease (CAD). EBSCO DynaMed Plus website. Available at: http://www.dynamed.com/topics/dmp~AN~T116156/Coronary-artery-disease-CAD . Updated June 7, 2017. Accessed September 13, 2017. Management of stable angina. DynaMed Plus website. Available at: http://www.dynamed.com/topics/dmp~AN~T114265/Management-of-stable-angina . Updated April 10, 2017. Accessed September 13, 2017. 4/10/2007 DynaMed Plus Systematic Literature Surveillance http://www.dynamed.com/topics/dmp~AN~T114265/Management-of-stable-angina : Boden WE, O'Rourke RA, Teo KK, et al. Optimal medical therapy with or without PCI for stable coronary disease. N Engl J Med. 2007;356(15):1503-1516. 11/7/2007 DynaMed Plus Systematic Literature Surveillance http://www.dynamed.com/topics/dmp~AN~T901116/Revascularization-for-coronary-artery-disease-CAD : Bravata DM, Gienger AL, McDonald KM, et al. Systematic Review: The comparative effectiveness of percutaneous coronary interventions and coronary artery bypass graft surgery. Ann Intern Med. 2007;147(10):703-716. 1/6/2009 DynaMed Plus Systematic Literature Surveillance http://www.dynamed.com/topics/dmp~AN~T113766/Coronary-artery-disease-possible-risk-factors : Surtees PG, Wainwright NW, Luben RN, Wareham NJ, Bingham SA, Khaw KT. Depression and ischemic heart disease mortality: evidence from the EPIC-Norfolk United Kingdom prospective cohort study. Am J Psychiatry. 2008;165(4):515-523. 6/5/2009 DynaMed Plus Systematic Literature Surveillance http://www.dynamed.com/topics/dmp~AN~T116156/Coronary-artery-disease-CAD : Sinha R, Cross AJ, Graubard BI, Leitzmann MF, Schatzkin A. Meat intake and mortality: a prospective study of over half a million people. Arch Intern Med. 2009;169(6):562-571. 7/6/2009 DynaMed Plus Systematic Literature Surveillance http://www.dynamed.com/topics/dmp~AN~T113884/Physical-activity-for-cardiovascular-disease-prevention : Kodama S, Saito K, Tanaka S, et al. Cardiorespiratory fitness as a quantitative predictor of all-cause mortality and cardiovascular events in healthy men and women: a meta-analysis. JAMA. 2009;301(19):2024-2035. 7/6/2009 DynaMed Plus Systematic Literature Surveillance http://www.dynamed.com/topics/dmp~AN~T113766/Coronary-artery-disease-possible-risk-factors : Fung TT, Malik V, Rexrode KM, Manson JE, Willett WC, Hu FB. Sweetened beverage consumption and risk of coronary heart disease in women. Am J Clin Nutr. 2009;89(4):1037-1042. 11/26/2012 DynaMed Plus Systematic Literature Surveillance http://www.dynamed.com/topics/dmp~AN~T113766/Coronary-artery-disease-possible-risk-factors : Kivimaki M, Nyberg S, Batty G, et al. Job strain as a risk factor for coronary heart disease: a collaborative meta-analysis of individual participant data. Lancet. 2012;380(9852):1491-1497. 7/21/2014 DynaMed Plus Systematic Literature Surveillance http://www.dynamed.com/topics/dmp~AN~T115449/Dietary-considerations-for-cardiovascular-disease-prevention : Afshin A, Micha R, Khatibzadeh S, Mozaffarian D. Consumption of nuts and legumes and risk of incident ischemic heart disease, stroke, and diabetes: a systematic review and meta-analysis. Am J Clin Nutr. 2014;100(1):278-288. 9/29/2016 DynaMed Plus Systematic Literature Surveillance http://www.dynamed.com/topics/dmp~AN~T113766/Coronary-artery-disease-possible-risk-factors : Batelaan NM, Seldenrijk A, Bot M, van Balkom AJ, Penninx BW. Anxiety and new onset of cardiovascular disease: critical review and meta-analysis. Br J Psychiatry. 2016;208(3):223-231.